The staple of the private eye genre is that people get into trouble and then need help getting out. That holds true in Philip Marlow’s Los Angeles and in Chanse MacLeod’s New Orleans, pre- and post-Katrina, so he is usually hard at work. In this book, Jonny O’Neil, a mixed-martial arts fighter, insists that his mother Mona O’Neill is missing. She missed his last fight, something she’s never done before, and his siblings Robby and Lorelle haven’t heard from her for the past four days, either. Obviously MMA fighters don’t make a lot of money, and Jonny’s wife is very pregnant, but there is something appealing about Jonny and his concern for his mom. Chanse warns that missing person cases are money pits, and there are usually two outcomes: The person does not want to be found—or is dead. The case grows more complicated when it turns out Mona has been sitting vigil in a church the Archdiocese of New Orleans wants to close. When searching Mona’s well-kept house, just a few blocks away from Jonny’s wretched abode, Chanse finds a $50,000 check from Morgan Barras, a well-known and universally reviled local real estate developer. Six years after the devastation of Katrina, New Orleans continues to recover, mentally and physically, but there’s money to be made nonetheless. Turns out Barras had his fingers in a lot of pies, and had made it known he wanted to manage Jonny’s fight career—maybe and this $50K was a down payment? Or could it be that Barras was looking to bribe Mona so she’d abandon her vigil at the church—and he could then pounce on the land? Mr. Herren clearly loves his city: He tells the reader where to eat, what streets his main character is driving, and why society and class are still so important in New Orleans. And Greg Herren knows how to tell a crime story without resorting to inane stereotyping. Chanse happens to be gay, and his current beau works at the NO/AIDS task force where Jonny has to be tested before he can fight. Jonny’s not embarrassed to go to the clinic, he’s straight, and there’s lots of blood in his line of work, so if he has to be tested, he’ll be tested. No anti-gay bluster here. On the other hand, Loren McKeithen, a top attorney in the city is gay and connected, and Chanse doesn’t trust him as far as he could throw him—and at Loren’s body weight that wouldn’t be far. Loren also wants to find Mona for a case he’s working on, so why won’t his firm pay Chanse’s daily rate? Jonny sure can’t. Loren’s being gay doesn’t make him any less of a shark, just as Jonny’s being straight doesn’t make him the enemy. It’s a pleasure to read a novel in which sexual orientation is not a defining characteristic, but merely another component of character, like blond hair or brown eyes. The designer of the book cover might take note of this: Was there really a compelling reason to have a shirtless man behind the skyline of New Orleans to sell the book? 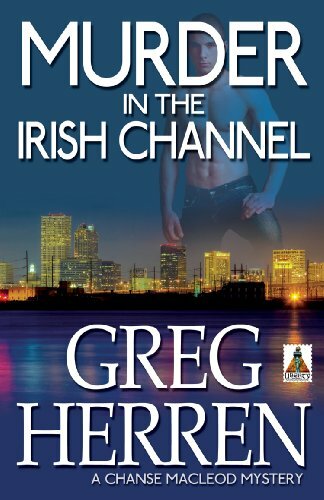 You should be able to find Murder in the Irish Channel with the other PI mystery books, for the gay ghetto at your local bookstore should be shrinking every day.